One of the first people I met, upon my return from London, was Mme. de Ségur, and I frequently went to see her. One day her husband told me that my journey to England had displeased the Emperor, who had curtly remarked, “Mme. 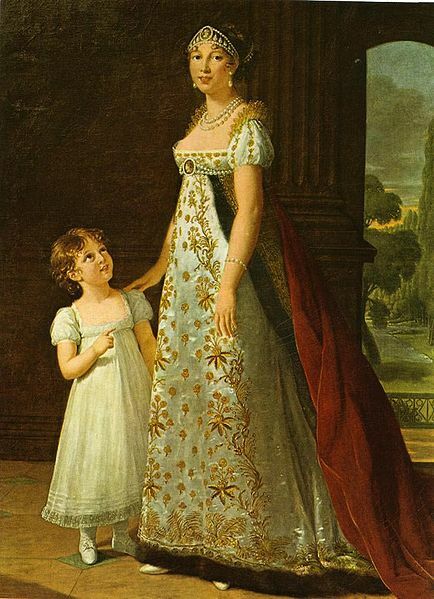 Lebrun went to see her friends.” But Bonaparte’s resentment against me could not have been violent, since, a few days after speaking thus, he sent M. Denon to me with an order to paint his sister, Mme. Murat. I thought I could not refuse, although I was only to be paid 1,800 francs – that is to say, less than half of what I usually asked for portraits of the same size. This sum was the more moderate, too, because, for the sake of satisfying myself as to the composition of the picture, I painted Mme. Murat’s pretty little girl beside her, and that without raising the price. I could not conceivably describe all the annoyances, all the torments I underwent in painting this picture. To begin with, at the first sitting, Mme. Murat brought two lady’s maids, who were to do her hair while I was painting her. However, upon my remark that I could not under such circumstances do justice to her features, she vouchsafed to send her servants away. Then she perpetually failed to keep the appointments she made with me, so that, in my desire to finish, I was kept in Paris nearly the whole summer, as a rule waiting for her in vain, which angered me unspeakably. Moreover, the intervals between the sittings were so long that she sometimes changed her mode of doing her hair. In the beginning, for instance, she wore curls hanging over her cheeks, and I painted them accordingly; but some time after, this having gone out of fashion, she came back with her hair dressed in a totally different manner, so that I was forced to scrape off the hair I had painted on the face, and was likewise compelled to blot out a brow-band of pearls and put cameos in its place. The same thing happened with her dress. One I had painted at first was cut rather open, as dresses were then so worn, and furnished with wide embroidering. The fashion having changed, I was obliged to close in the dress and do the embroidering anew. All the annoyances that Mme. Murat subjected me to at last put me so much out of temper that one day, when she was in my studio, I said to M. Denon, loudly enough for her to hear, “I have painted real princesses who never worried me, and never made me wait.” The fact is, Mme. Murat was unaware that punctuality is the politeness of kings, as Louis XIV. so well said.